To capture the autobiographical awakening of sexual urges in teen boys, filmmaker Eyal Resh put all his faith in the hands of his young lead actors. Resh’s Boys is a short film that is content to objectively observe the friendship between Brian (Wyatt Griswold, “The Loud House” TV series) and Jake (Pearce Joza, “Mech-X4” TV series) as they hang out together during an impromptu summer sleepover. Resh’s camera is a fly on the wall, never judging, assuming or peering inside either boy’s head, simply watching. The boys play together, make prank phone calls (the bedroom decor suggests this is set in the early 90s, when prank calls were actually made and elevated into an art form), wrestle around, and just generally act like, well, teenage boys. There’s not much more to the movie than that, other than its thematic thread of budding sexuality and the discomfiting confusion around how to deal with it. There’s much to be said here via Resh’s humanist approach, but it can only work if the actors sell their parts. Considering their young age, slightly stiff performances would be understandable and even forgivable, but instead Griswold and Joza create completely convincing and carefully compelling characters that are so raw and real that it feels as though we’re peering in on their actual lives, interactions, and moments. The pair of powerful performances is exactly what the movie needs to make an intriguing impact and justify Resh’s observant style. It’s impossible not to believe in Brian and Jake, so deeply invested are the actors. Ultimately, the movie is just a whisper, offering only a glimpse of a first experience that will certainly come into better focus in the future, so it leaves us wanting to know more, but Resh expertly captures the moment he’s aiming for with all the honest awkwardness that anyone could muster. It’s a personal story that requires the boys of Boys to be believable, so it’s both most impressive and satisfying that Griswold and Joza work wonders under Resh’s watchful eye. 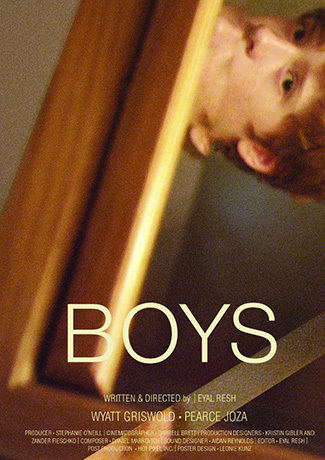 Intimate, delicate, authentic, Boys plays like a love letter to the trust that can be forged between actors and their director when fiction and reality collide. How do you find the short film?